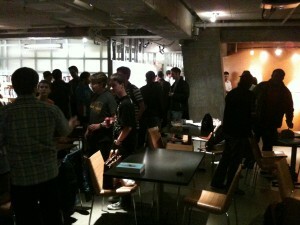 Seattle Transit Blog teamed up with Northwest Hub last Thursday to host another meet-up. The partnership — as well as the kindness of GGLO in hosting the event in a great space — meant we saw many new faces and had a great time. So fun, in fact, that I even got to eat a whole apple. The turn-out was pretty high and we’ll have to look into using the GGLO space again. The meet-up was pretty heavy with guests. First up, Andrew Glass Hastings and Rachel Smith — both ran the Mass Transit Now! campaign last year — spoke about the city council race in Bellevue and how we only need to win one of the four races to preserve light rail through downtown. We’ll be covering this more in the future. Next up were three speakers who were invited by Northwest Hub, and all focused on transit-oriented development. The first speaker spoke about a specific TOD project he was working on in Columbia City, and noted some of the challenges he has with slowness of Seattle’s planning department as well as the economic environment in general. 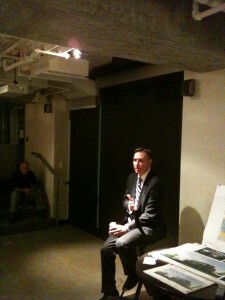 Second, Chuck Wolfe gave a detailed lecture about how to move toward TOD politically. Drawing a lot of lessons from the current political climate, this speaker had the line of the night: “Mallahan is surrounded by great advisers. McGinn knows his stuff.” Finally, Sara Nikolic from Futurewise spoke about their work on the TOD bill during the last legislative session — which failed to pass — and how to get a bill passed this coming legislative session. He showed a nuance position on the tunnel, acknowledging (correctly) that infrastructure creates demand but also not wanting to re-start the Viaduct replacement process since zany, crazy ideas could come back to the forefront and waste all of our time. Still, he knew his audience and did not attack surface/transit. He weighed in on the suspensions vs. cuts debate and stated that the suburban advantage on the council may make for an uphill battle. He said it was more important to fundamentally reform service allocation and end the 40/40/20 policy. He said that trolley buses last longer and that we shouldn’t replace them with hybrids, but with newer trolleys. After Constantine was done taking questions, he lounged around with readers for another 45 minutes or so. He’s a pretty wonky, candid guy. I’m happy we’ve endorsed him. Also making the rounds was city council candidate David Ginsburg, who’s running an up-hill election against incumbent Richard Conlin. Ginsburg had the best glasses of the evening. Thanks again to Jesse, Emily, and Ashley from Northwest Hub for partnering with us. And thanks to all of the guest speakers and blog readers who showed up. Correction: The first TOD speaker was talking about a project next to Mount Baker Station, not in Columbia City. Does anyone have more information about this project? Good meet-up, I’m glad I finally got a chance to meet Dow in an informal setting. I think the joint meet-up worked fairly well. Though some of the TOD speakers were a bit dry and wonky. I’d like you to continue to explore future opportunities for meet-ups with Northwest Hub, Futurewise, Sightline, Transportation Choices Coalition, and similar minded organizations. Ginsberg seems like a good guy, but I don’t think he really has a compelling case for why he should replace Conlin. Especially since they mostly agree on the issues I care about. Ditto – I appreciated the intention – but I walked out long before Dow even got started. Just wasn’t interested in the TOD material as much, and it was more abstractly presented than some of the CNU speakers I’ve seen. Personally I’d headline the speakers of the most broad relevance and interest first. Hey I was a first timer there and while I think it would have been cool if Dow went first the lawyer guy and the architect were pretty interesting. I looked at the materials and followed the weblink to the report that Chuck discussed. It is a good summary of TOD–www.qualitygrowthalliance.org I don’t think that report that Sara talked about is done yet so I guess we have to wait for it a little while. Good job, people. Yes, it was great to meet Dow and talk to him and ask him questions. He makes up for much of the lackluster feelings I have towards the Seattle mayoral race which as msot of you know fills me with gloom. The King County Executive race, however, has me much more energized and I feel we are more united on this race than we are on the mayoral one. I tihnk that Mr. Constantine made it clear, in answer to my question, that he was NOT incline to open up further discussion on the best way to replace the viaduct beyond moving ahead with the tunnel option. If elected and Mike McGinn wins in Seattle as seems probable, then I do not see Mr Constantine throwing his official weight behind the possible future mayor’s campaign to reopen old wounds. This said, Mr Constantine, perhaps more from tiredness than anything else, didn’t offer a ringing or loud endorsement of the tunnel – simply that like me, he saw no purpose in reopening the discussion at this point in time. I’d love to hear what folks thought about the project by Mt. Baker Station. I believe it is their South Bennett Street project – correct? It looks great and definitely would be a nice addition to the neighborhood. I’m wondering how they pitched it as TOD it seems to be much less dense (as envisioned by the former 1490 bill) and also shows a car in the drawings. I really enjoyed talking with everyone at the meetup. I wish I’d had more time to talk policy and answer questions, but due to a candidate forum earlier in the evening which went a bit long I wasn’t able to get there until just as Dow was finishing up. I did take Link Light Rail to and from the forum, and that I am a strong proponent of rail-based transit and I believe we need grade-separated rail as the backbone of our transit system to connect our urban villages and urban centers. The incumbent and I differ on this. In another forum last night in North Seattle we were asked what mode of transportation the city hasn’t invested enough in and should therefore increase it’s investment in. Mr. Conlin said buses. I said, in keeping with my platform and everything I’ve said in this campaign, that what we needed was light rail as a backbone to connect our urban villages and urban centers. I’ve proposed a mechanism to do this by providing additional funds through a Transportation Benefit District to Sound Transit to bring light rail to Seattle neighborhoods not on ST’s roadmap. This exemplifies the choice in this race. I invite you all to check out my website at http://www.davidginsberg.org, and if you have questions please email me through the address on the website. Cheers!